Our History « Cologne, Minnesota | A great place to Live, Work and Grow! The history of Cologne begins with not one, but two villages – Benton and Cologne. Benton was incorporated in 1881, on land owned by Capser Kronschnabel, with a population of 100 citizens. It was named after the distinguished American statesman, Thomas H. Benton, who died in 1858. The Village of Cologne was also incorporated in 1881 on land owned by Adam and Paul Mohrbacher. Cologne was named by the Mohrbachers after Cologne, Germany . . . the city from where they emigrated from. Both communities thrived for nearly 10 years, with farming and milling playing a large part in the economic make-up of both villages. In 1891, the two villages merged into the Village of Cologne, although Benton was not officially annexed by Cologne until the late 1970’s. Main Street of Cologne in the early years, included two general stores, two saloons, a hardware store, drug store, furniture store, blacksmith shop, wagon shop, a grist mill and a grain elevator. Another vital factor in the history and growth of Cologne, is the railroad. The first railway was constructed in 1872. The Hastings and Dakota Railroad Company built it to form a connection between Glencoe and Minneapolis by way of Norwood, Cologne and Chanhassen. 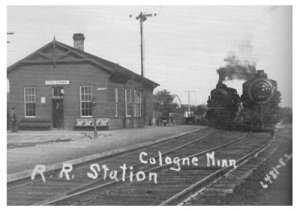 Although the last station agent in Cologne left in 1977, and the depot, roundhouse and water tanks have since been torn down, the railroad continues to roll through Cologne hauling freight as it did in the 1800’s. Cologne has played host to some famous dignitaries over the years, such as Charles Lindberg (campaigning for Governor in 1918) and George H. Bush (campaigning for Vice President in 1984). It was also the preserved on film in the amateur short subject Cologne: From the Diary of Ray and Esther, which chronicles aspects of life in the German-American community prior to the American engagement in World War II. The film was named to the National Film Registry in 2001, and is one of only a half-dozen amateur works to be included on the list.